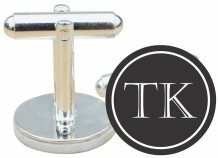 Our personalized cuff links will be etched with your custom initials or text. Choose from one of our many custom colors to add a personalized touch to your special day. Please note that only capital letters are available in this font.